One of our partners and friends, Jason Kauflin, is moving up the ranks thanks to his recent partnership with The Bloomington Minnesota’s Convention and Visitors Bureau. Under the leadership of Bloomington Minnesota’s Convention and Visitors Bureau, industry golf veteran Jason Kauflin has been selected to represent all international and domestic golf tour operator requests for the popular Great Northern Golf Trail. Kauflin, no stranger to Midwest golf, is a perfect fit. He has been booking large-scale golf trips for almost 20 years and flourishing in his home state with Wisconsin Golf Trips, developing custom stay-and-play packages for groups from around the world at some of the best courses and hotels. The Great Northern Golf Trail is the golfer’s link to championship golf in the northern region of the United States. The itinerary starts in Bloomington, home of Mall of America, and only minutes from MSP International Airport. Bloomington gained recognition as the hospitality hub of the 2016 PGA Ryder Cup hosted by Hazeltine National Golf Club. Hazeltine will also host the 2019 KPMG Women’s PGA Championship the 2020 U.S. Junior Amateur Championship, and the 2028 Ryder Cup. TPC Twin Cities in Blaine, Minnesota, a north suburb of Minneapolis, will host the newly announced 2019 3M Open. Golfers following the Great Northern Golf Trail arrive at MSP International Airport and play and stay in Bloomington, MN. Bloomington CVB has put together great golf experiences for visitors with these 7- to 14-day golf itineraries. Visitors can play some of the best courses in the MSP metro (Legends Club, The Wilds) then head north to Brainerd Lakes golf trail and play The Classic at Madden’s, Deacons Lodge, The Legacy Courses at Cragun’s, as well as The Pines and The Preserve at Grandview Lodge. From there, golfers can move east and stay in Biwabik, MN and play The Wilderness at Fortune Bay and Giants Ridge. Players can continue to the neighboring state of Wisconsin, home of the 2020 PGA Ryder Cup, arriving at Destination Kohler to play Blackwolf Run, Whistling Straits and The American Club. 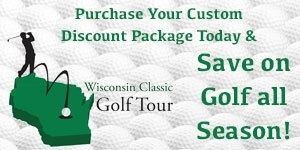 Most of the resorts offer 2 night/3 rounds or 3 night/4 rounds packages. 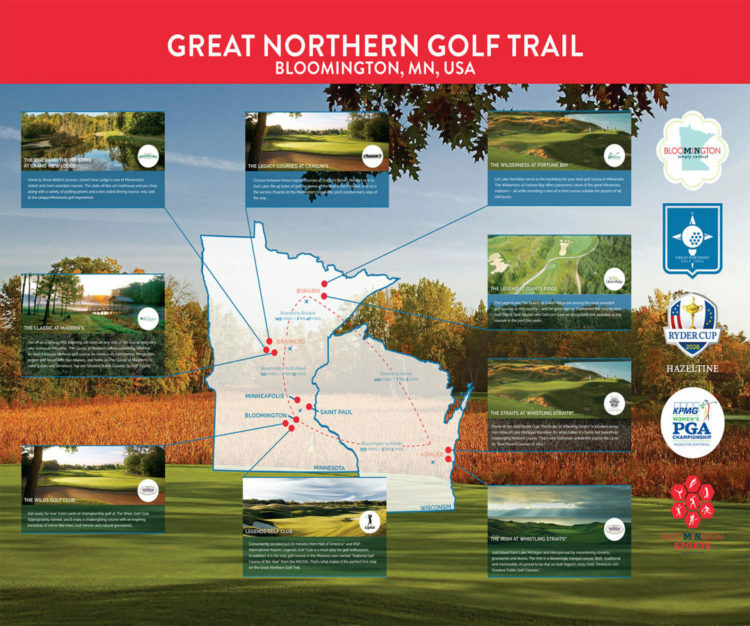 See www.GreatNorthernGolfTrail.com and contact Dan O’Neill doneill@bloomingtonmn.org or Todd Lehrke tlehrke@bloomingtonmn.org for more information.